Lemon Life: no news is good news! The white blob on the right side is my heart. If you look closely there is a dark tube shaped thing above my heart this is my trachea. If you want to see a normal x-ray you can look it up on google. Essentially the white heart blob is in the middle and the lungs (large darkish shape on the left) are equal on both sides. Pretty cool huh? 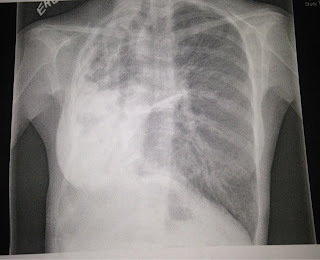 My right lung collapsed so my body adapted, shifting the heart over and expanding my left lung!